"I used to visit the restaurant of a friend who was a chef. He made the best mushroom sauce for beef, but would not share his recipe. After trial and error, I think mine comes very close to his. This haute cuisine sauce makes everyday steaks or roasts into something a little more elegant. Serve atop grilled steaks, hamburger steaks, roasted beef or venison. Bon Appetite!" 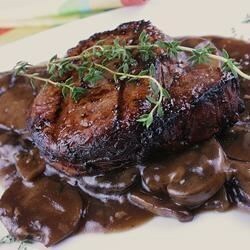 Rich, delicious Bordelaise sauce is surprisingly easy to make. This is a tasty sauce, but it is NOT Bordelaise! For it to be Bordelaise sauce, it must have bone marrow in it. This is wonderful! I used red onion instead of shallots (just what I had on hand) and it turned out wonderful. Thanks for the recipe! This is great. We had it over rib-eyes, and people scrounged the pot to put it on their baked potato too.